The very first thing that struck me about the trailer was it’s visual symmetry with Mad World. 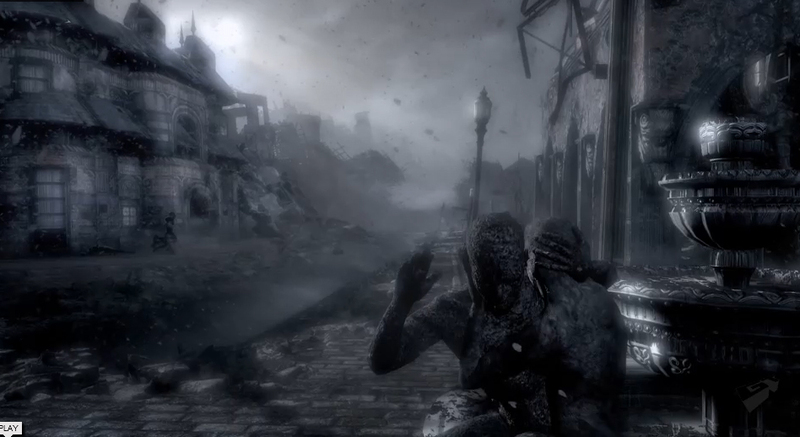 Every good story ends where it began, so starting this trailer off with a shot virtually identical to the intro shots of mad world not only puts a fitting book end on this series of trailers, but also serves to remind us of where this war all started – on a dead city street, with Marcus Fenix facing a horde of Locust all alone. But this time, it’s not Marcus we’re with. Instead, we’re re-introduced to Marcus’ old friend Dominic Santiago, who, as you can see above, is still running from the dead. 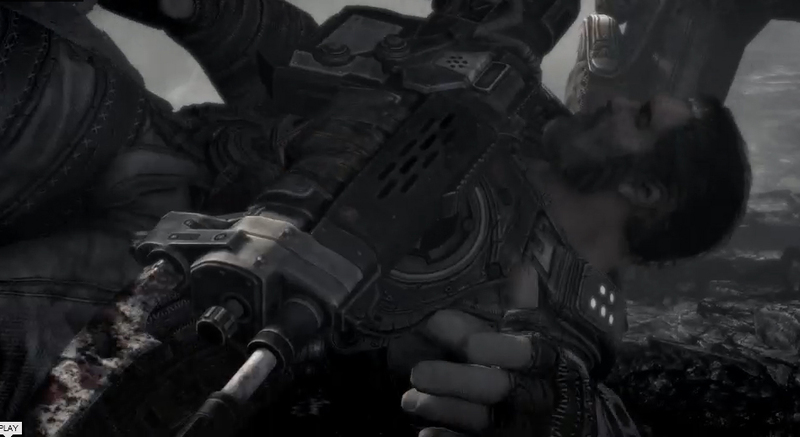 Dom’s story arc has always been the human core of the Gears story. 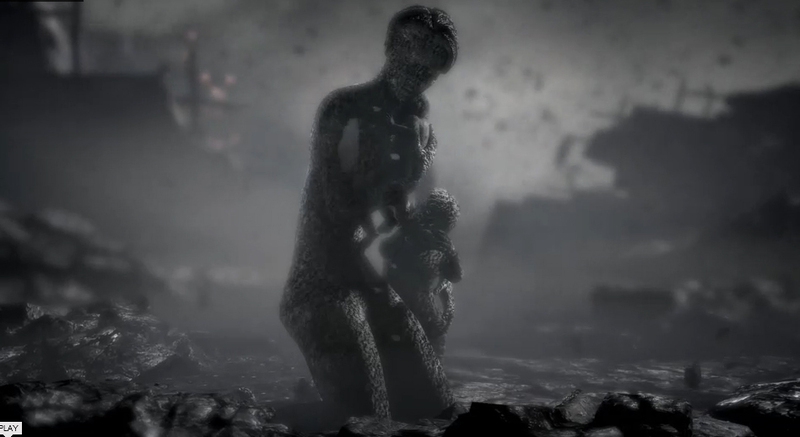 Through the events of the original Gears of War, Dom is consumed with finding his wife and two children, all of whom have been missing since E-Day. 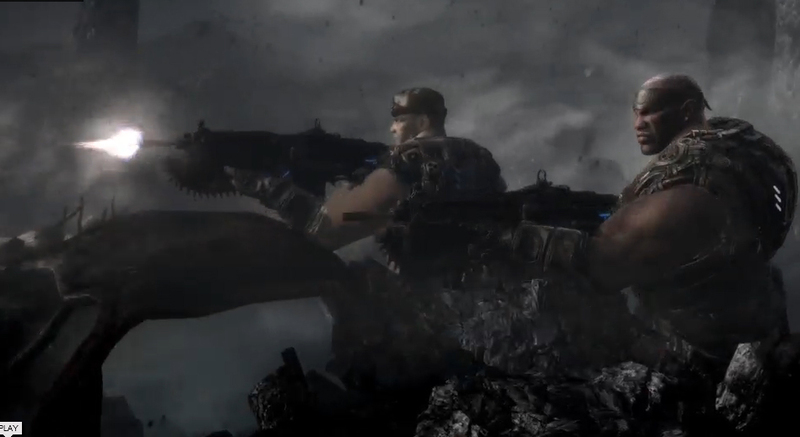 After the events of Gears 2, Dom cannot let go of their memory. As you can see above, after Dom stumbles to the ground, he looks back to see ashes that clearly remind him of his wife Maria and their two young children. I think one of the best moments in the trailer happens after he sees these ashes. A locust drone comes crashing through the ashes, clearly symbolizing how the Locust have destroyed everything Dom loves. And how does Dom react? He lays his head back and closes his eyes. Dom has given up. He’s clearly decided that he’s ready to die and be with his family. It’s also worth noting Dom’s appearance in the trailer, as well. This is the first clear look we’ve had of the soldiers in the video, and if Dom is any indication, the war has taken it’s toll. He’s looking worn out, dirty, and he’s grown a beard. Delta’s been on their own for some time. In a conversation I was having on Twitter, @CaliDrifter brought up the stranded. 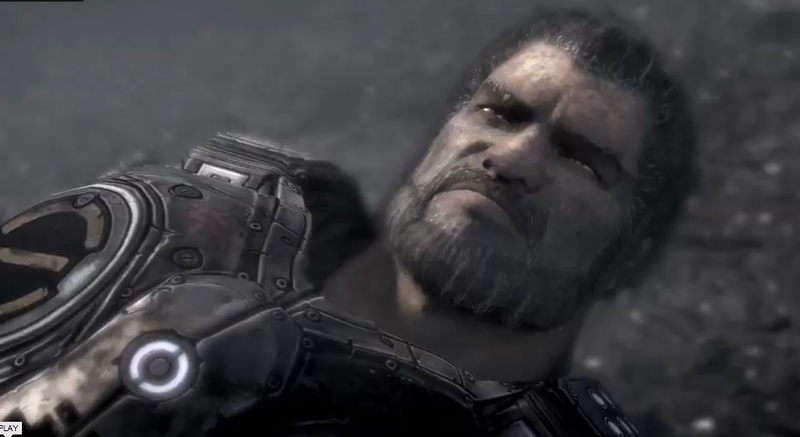 It looks to me that with the destruction of Jacinto at the end of Gears 2, perhaps all of humanity have become Stranded. 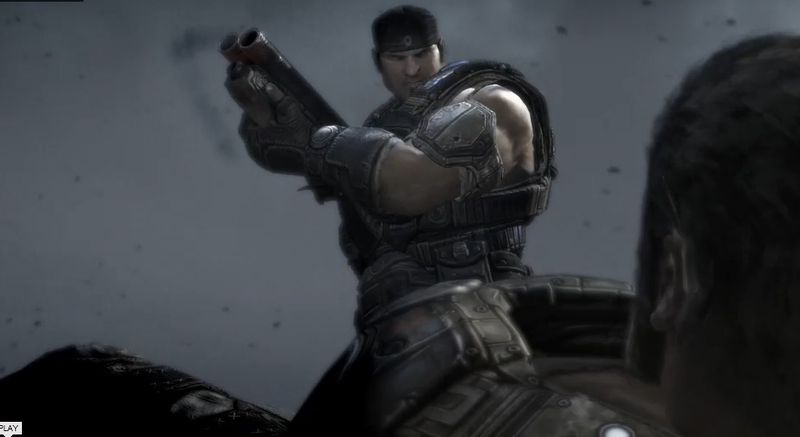 And just as Dom saved Marcus Fenix from certain death in the first moments of the original Gears of War, Marcus returns the favor by saving Dom’s skin before he gets himself killed. Notice that Marcus’ sleeves are gone, more evidence that all of Humanity is Stranded, and it’s getting harder and harder to replenish supplies for the fight against the locust. More evidence of supply shortages – the weapon thrust onto Dom’s chest is a Pendulum Wars-era Lancer. Notice the fixed bayonet, instead of the chainsaw bayonet we’ve all become accustomed to. So, who’s handing Dom his weapon? Cole and Baird are also both back with Delta, and keeping the sleeveless theme going, no less! Times are indeed rough for the soldiers of the COG, but it’s good to see some familiar faces! Interestingly enough, the fight is a little more crowded these days. 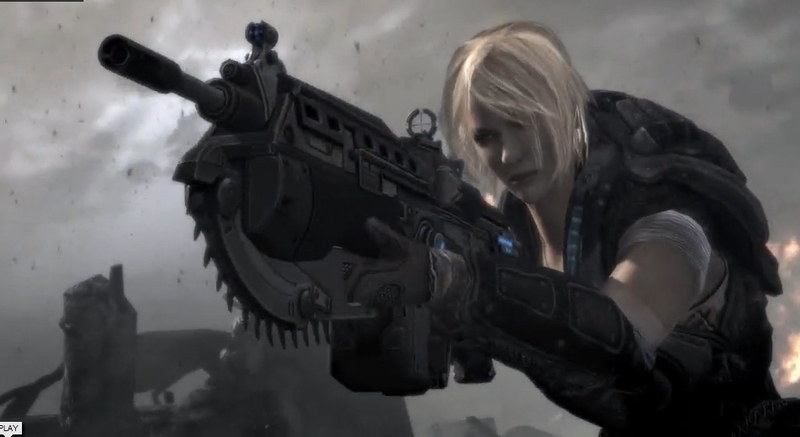 As we saw in Gears of War 2, the Locust are in some trouble of their own. 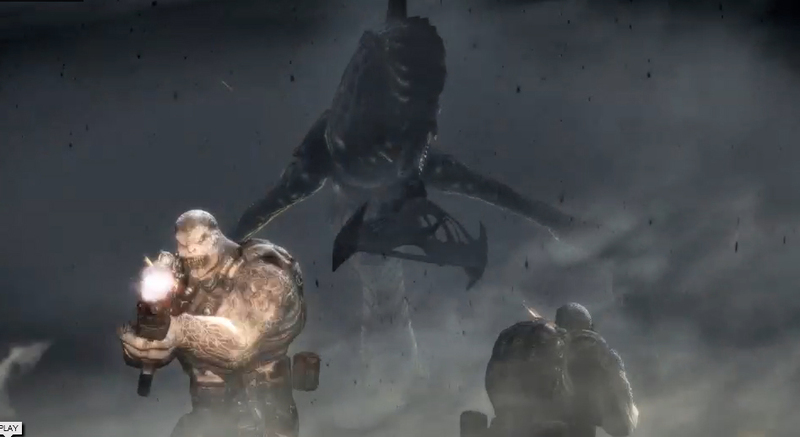 In this trailer, it looks like the Lambent are getting bigger and meaner, and as the picture clearly illustrates, the Locust are now caught inbetween the Humans and the Lambent. This actually reminded me of an old article I read on GamesRadar about who the real victims are in the Gears of War universe. Give it a read. I think there’s a lot of meaning in this one. Not only does it speak to the brotherhood among the members of Delta Squad, butI personally believe this is foreshadowing the death of Dom Santiago. Dom’s clearly lost a lot of his will to fight, given that his reason for living is gone. 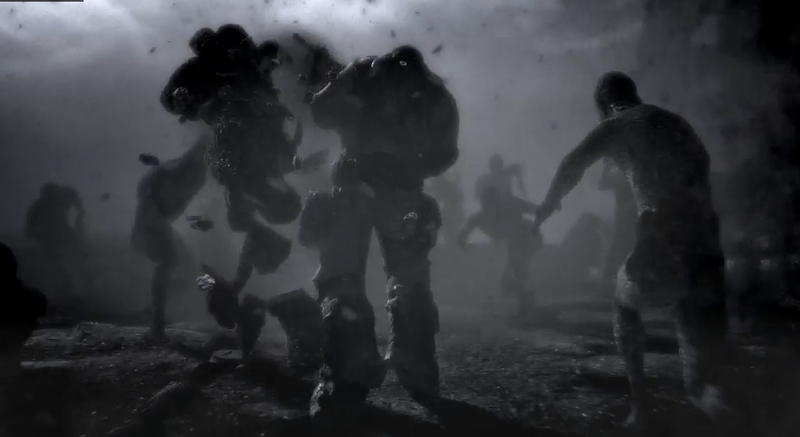 It looks like in Gears of War 3, Dom’s going to have to discover a new reason to fight, namely his Delta Squadron family. I’m guessing he’ll find this peace just in time to sacrifice himself to save them all. We’ll find out in April of next year, I suppose. What did you think of the trailer? I am a little embarassed to say anything here after such a good post and as I am not so good in english… but I try. Focusing on the armors may reveal others things that could go in the same way as your thoughts but there’s an another idea emerging. Marcus has a very light armor here, the double barreled shotgun, the Dom’s Pendulum Lanzor, the lack of Gears tag on the armor let think that the team is not part of the COG army any more. 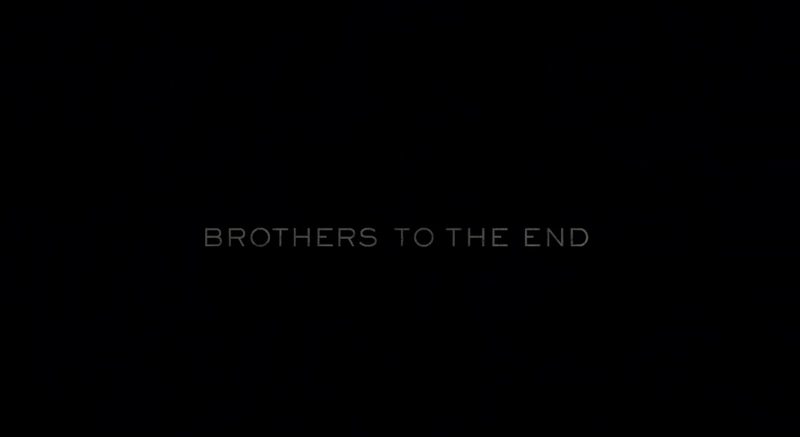 Dom, on his side, wants clearly to meet his family, the teaser let no doubt about it and I think the last tagline means that he will surely sacrifice himself for a greater good. At least, someone is going to die, that’s obvious to me. All these years of conflicts may have changed them, have exhausted them and fragilise them, as Dom. The emotional part of the story will certainly be greater and more with the Anya’s presence (which you don’t talk about). I love the idea of a suicide mission (as we recenlty saw in Mass Effect)and, for sure, I can not wait to see the Karen Traviss’s work. You’re right, I didn’t touch on the Anya thing very much, but I do agree with you. Having Anya on the battlefield next to the guys, particularly Marcus, presents a great opportunity for some character and relationship development, particularly with Marcus. Good to see Anya on the field. She has such a heart wrenching back story. Everyone NEEDS to go read the books by Karen Traviss.